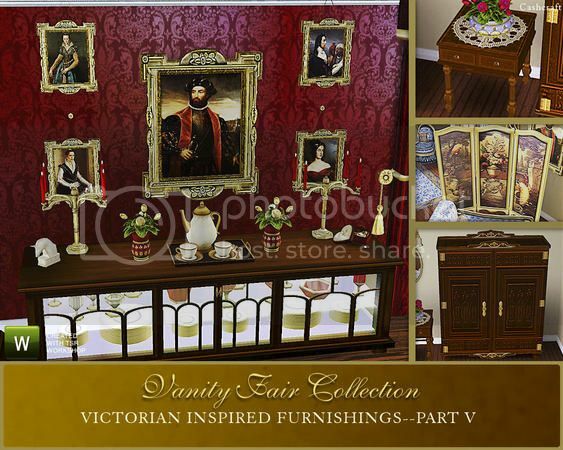 Vanity Fair Part V, is a collection of Sims 3 decorative pieces and furnishings for the Victorian and English Regency home. The set includes an armoire, room screen, 3-tile sideboard with china, end table with doily, and much more! A total of 16 new objects! 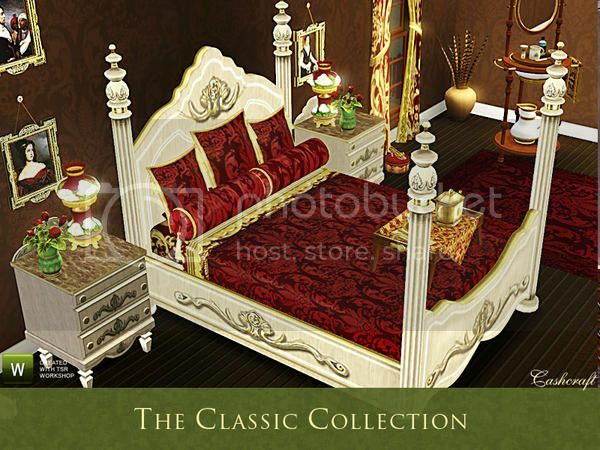 It’s a collection of classic and traditional bedroom furnishings. 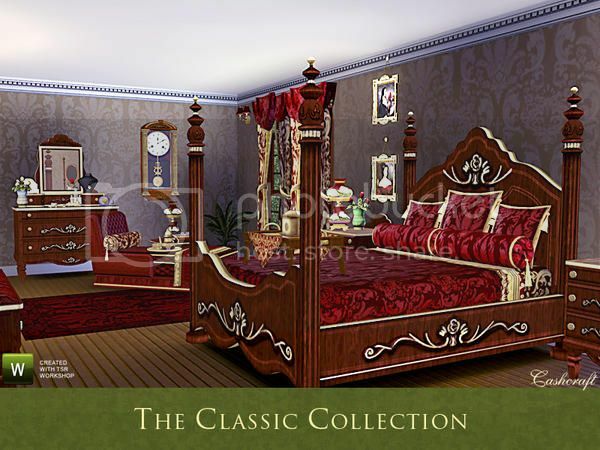 The collection features a massive four-post bed, a dresser with mirror, an animated dresser, tufted chaise lounge, a throw, antique wall clock (decorative only), a smaller version of the potpourri double-globe table lamp, nightstand, flowers in a vase, cushioned bench, and several decorative paintings in an ornate frame. The set is suitable for a male or female Sims. 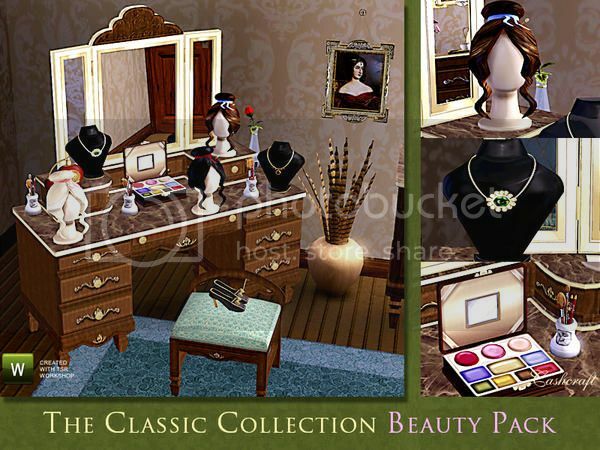 The Classic Collection Beauty Pack is a decorative and functional add-on pack for The Classic Collection bedroom suite! It includes 10 new objects, a vanity dressing table (cloned from a mirror), vanity chair (surface), makeup case, makeup brushes sets, ruby and emerald necklaces, and a selection of wigs. Your Sims is going to feel so glamorous! Classic Collection Part III is the Fashion Pack, which includes a tall cabinet (cloned from a dresser) with 23 slots and re-colorable glass doors, 3 dress form mannequins (1 dress form is re-colorable), a trio of re-colorable hanging evening handbags, which can be shifted up and down the wall, and a stylist Georgian inspired wig (Marie). 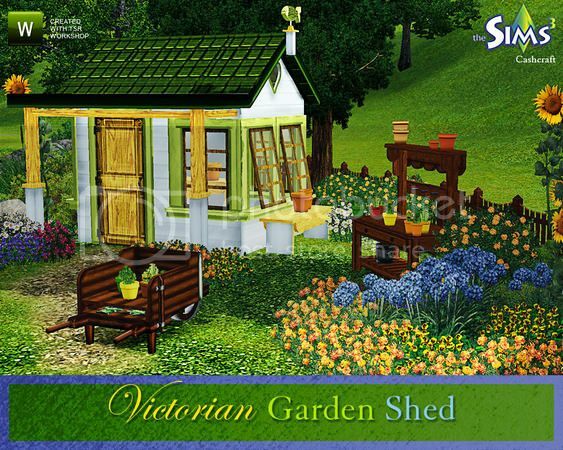 The Victorian Garden Shed set includes a 5x5 decorative garden shed, 3-tile potting table with slots (desk), wheelbarrow (cloned from a coffee table), single and a trio of potted herbs. Spring is here! A new Sims 3 collection of bathroom furnishings and fixtures! 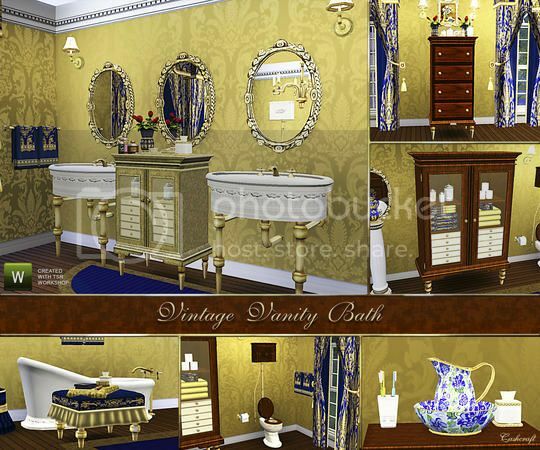 The vintage set includes 16 meshes, a console sink, tub, toilet, storage cabinet, chest of drawers (end table), several deco objects and so much more! Pour the bath oil, light the candles, and enjoy a relaxing spa experience. 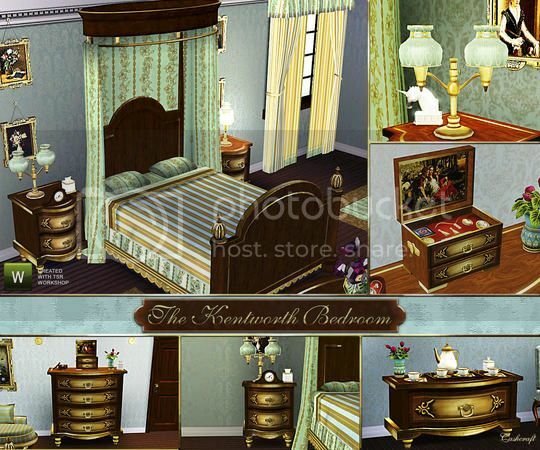 The Kentworth bedroom set features the following antique furnishings: a half-tester bed, two-drawer nightstand, two-globe table lamp, tall dresser, decorative jewelry box, and a hope chest. All set items are recolorable. 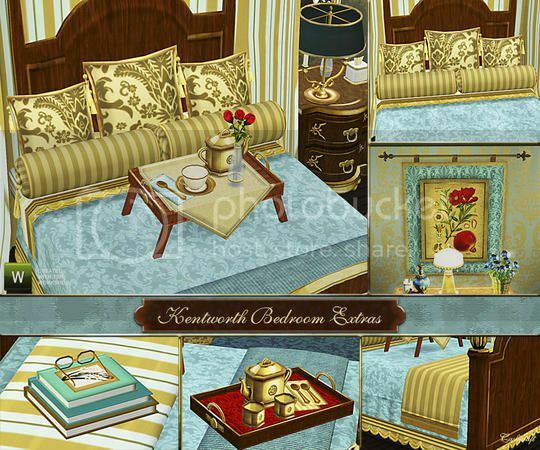 A second version of the Kentworth Bed with 3 slots and a few extras to fill those slots. The extras consist of a set of decorative designer pillows, 2 bed breakfast trays with 1 slot, books and reading glasses, wall hanging, 2 vases &amp; rose(s), and a bed throw with 3 slots. 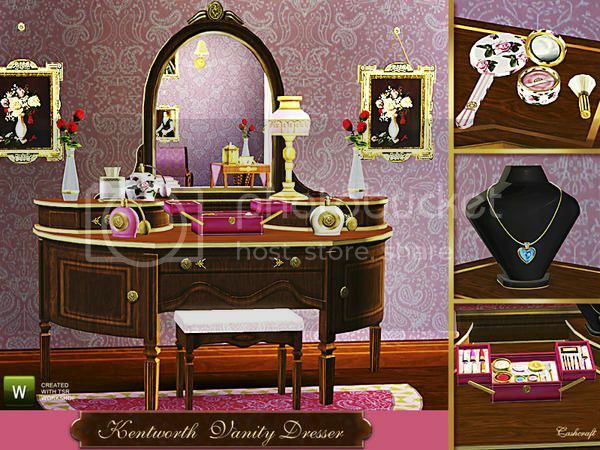 An elegant Victorian vanity dressing table with lots of room (12 slots) for cosmetics, perfumes, and other clutter, and it's cloned from a mirror--attached bench is decorative only! The set also includes 2 table lamps, 2 theatrical makeup cases, 2 decorative hand mirrors sets and the Heart of the Ocean necklace, rumored to have a mysterious past! It’s a collection of antique and vintage table lamps for the home. 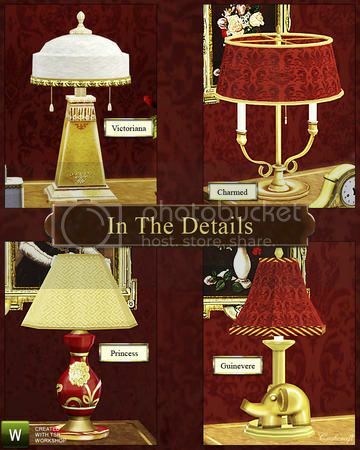 Featured is “Victoriana,” a favorite lamp from Sims 2, “Charmed,” a 2-post table lamp, “Guinevere,” perfect for a child's nursery, and “Princess,” with a delicate floral motif. When decorating your home—it’s all in the details!